If LocoNet is used without a connected central, LocoNet needs current supplied from somewhere else. This card , a so called LocoNet termination, is used for this. Can add 12 volt power to the LocoNet Railsync, if required. Needs a power supply of 12-15 volts which is not included. The card has three jumpers that can be changed to adapt the card to different usage. The card should be powered with a 12 volt power supply. 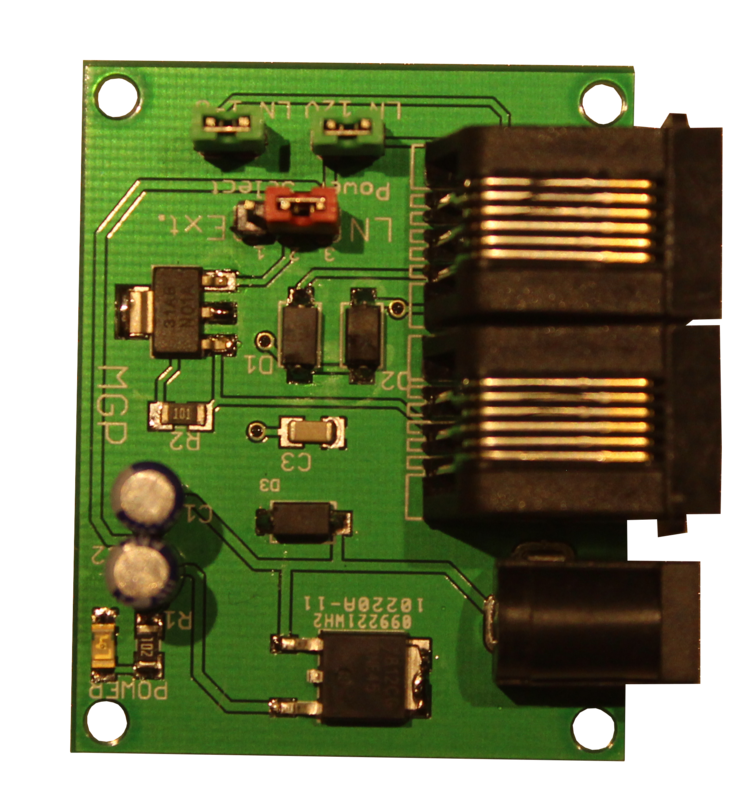 The card will supply 12 volt on LocoNet Railsync (max 0,5 A). This is the setting when the card is delivered. "Power Select" - jumper to the side marked "Ext"
With the MGP Electricity Distribution cards, the LocoNet Railsync is used as a power supply. This card will not need any external power supply. "Power Select" - jumper to the side marked "LN"
In some situations the current for the LocoNet signal needs added support.